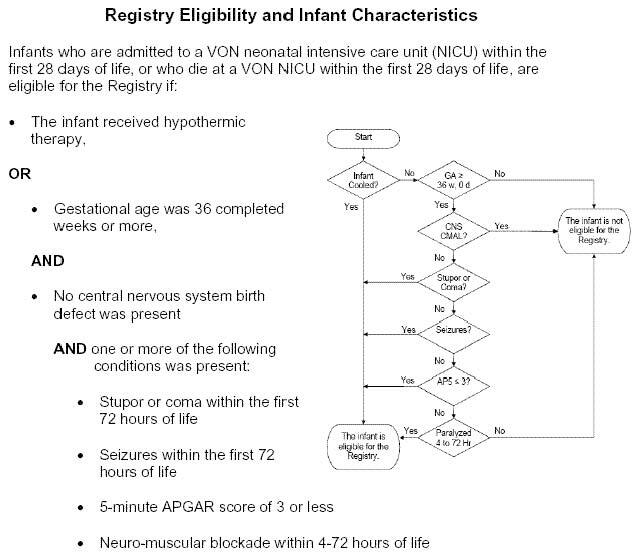 In 2006, the Vermont Oxford Network (VON) established the Neonatal Encephalopathy Registry (NER) to characterize infants born with neonatal encephalopathy, describe evaluations and medical treatments, monitor hypothermic therapy (HT) dissemination, define clinical research questions, and identify opportunities for improved care. Eligible infants were ≥ 36 weeks with seizures, altered consciousness (stupor, coma) during the first 72 hours of life, a 5 minute Apgar score of ≤ 3, or receiving HT. Infants with central nervous system birth defects were excluded. From 2006–2010, 95 centers registered 4232 infants. Of those, 59% suffered a seizure, 50% had a 5 minute Apgar score of ≤ 3, 38% received HT, and 18% had stupor/coma documented on neurologic exam. Some infants experienced more than one eligibility criterion. Only 53% had a cord gas obtained and only 63% had a blood gas obtained within 24 hours of birth, important components for determining HT eligibility. Sixty-four percent received ventilator support, 65% received anticonvulsants, 66% had a head MRI, 23% had a cranial CT, 67% had a full channel encephalogram (EEG) and 33% amplitude integrated EEG. Of all infants, 87% survived. The VON NER describes the heterogeneous population of infants with NE, the subset that received HT, their patterns of care, and outcomes. The optimal routine care of infants with neonatal encephalopathy is unknown. The registry method is well suited to identify opportunities for improvement in the care of infants affected by NE and study interventions such as HT as they are implemented in clinical practice. Neonatal encephalopathy (NE) in the term or late preterm infant is "a clinically defined syndrome of disturbed neurologic function in the earliest days of life manifested by difficulty with initiating and maintaining respiration, depression of tone and reflexes, subnormal level of consciousness, and often by seizures" . NE occurs in an estimated 2–5 per 1000 live term births of which up to one quarter experience moderate or severe cerebral injury [2–4]. Between 10-40% do not survive and as many as 30% exhibit significant long-term neurodevelopmental disability . Randomized controlled trials (RCTs) demonstrated that hypothermic therapy (HT) may improve neurologic and developmental outcomes and reduce death and disability in term infants with NE [6–9]. As a result, many practitioners have lost equipoise [10, 11]. The National Institute of Child Health and Human Development and the American Academy of Pediatrics Committee on Fetus and Newborn caution that clinicians should follow published trial protocols, ensure systematic follow-up of survivors, and submit patient data to registries when using HT outside of a trial [12, 13]. Registries, by documenting the natural history of enrolled patients as they present for care, monitor clinical patterns and patient outcomes in rare disorders such as NE and track the “real world” dissemination of a novel therapy like HT . The Vermont Oxford Network (VON) is a non-profit voluntary collaboration of health care professionals dedicated to improving the quality and safety of medical care for newborn infants and their families at over 850 neonatal intensive care units (NICU) around the world. The VON Neonatal Encephalopathy Registry (NER) was established in 2006. The primary objective is to characterize infants born with NE, including perinatal and antenatal risk factors, how these infants are identified, the evaluations and treatments they receive, and their outcomes. Secondary objectives include monitoring the dissemination and uptake of the novel therapies such as HT and description of variation of care applied to NE infants. These data will help define clinical research questions and identify opportunities for improved care of NE. This manuscript describes the methods and basic demographic results of the VON NER. Hospitals could enroll patients in the NER through participation in one of two databases maintained by VON. The very low birth weight (VLBW) database includes any infant born alive at a participating hospital with a birth weight 401–1500 grams or a gestational age of 22–29 weeks regardless of where the infant receives care, as well as any outborn infant meeting these criteria admitted to any location in the hospital within 28 days of birth without first having gone home. The Expanded database includes any infant regardless of birth weight or gestational age admitted to the hospital’s NICU by day 28. In 2006 and 2007, only VON Expanded database centers could participate in the NER. Beginning in 2008, all VON database participating centers were eligible. Participation in the NER requires no additional fee. VON uses these data for research and reporting, but maintains the confidentiality of individual hospital data. Participating hospitals receive reports comparing their local data with the Registry as a whole. A participating NER center submitted data on one or more eligible infants. Any infant born at 36 weeks gestation or more displaying evidence of NE within 3 days of birth is eligible. NE is defined as presence of seizures and/or altered consciousness (stupor, coma). In order to cast a wide net that captures all infants potentially affected by NE independent of the adequacy of their neurologic exam, infants with a 5 minute Apgar score of ≤ 3 are included. Accordingly, infants that received neuromuscular blockade are also eligible since their level of conscious could not be assessed. Regardless of neurologic status, any infant that received HT is eligible. Infants born with central nervous system (CNS) birth defects are excluded (Figure 1). Registry Eligibility and Infant Characteristics. The VON NER Steering Committee chose data items to characterize the population of all infants with NE, identify potential antecedents, evaluate variations in current practice, and monitor the dissemination of HT and adherence to the RCT efficacy standards. Data items include: patient identifiers, patient selection criteria, infant characteristics, treatments and tests, and outcomes at time of disposition. Where possible, data forms follow standards and terminology derived from existing studies to contribute to evolving medical knowledge. Participating centers receive explicit data definitions for each variable to ensure internal validity and uniform data acquisition. A complete catalogue of data items and definitions are in the manual of operations published on the VON website: http://www.vtoxford.org/tools/downloads.aspx. Centers collect and submit data using freely provided VON eNICQ software, which provides easy to use on-screen data definitions, immediate feedback on issues such as missing or out-of-range values, and error checking for logical inconsistencies. VON staff members perform additional data assessment and contact hospitals about missing data items, unresolved records, out-of-range values, and appropriate modifications as indicated. Only de-identified data are submitted to VON. The Registry does not dictate patient care, propose any interventions, or endorse any protocols for treatment. Each infant receives care according to the standards of that institution. There is no expected increased risk for participation of individual patients and only de-identified data are submitted. The University of Vermont and State Agricultural College Committee on Human Research in the Medical Sciences (CHRMS) Institutional Review Board (IRB) at the University of Vermont granted ethical approval for the methods of the NER (reference number CHRMS 06–100). Additionally, participating hospitals gained local IRB approval for the participation in the Registry. VON requires documentation of each participating center’s local IRB approval before participation in the Registry. Submitted data becomes the property of VON. The Network may use these data for research and reporting, but maintains the confidentiality of individual hospital data. Outcomes of interest in the NER include death prior to hospital discharge, survivor disposition status, neurologic course, presence of seizures, common neonatal co-morbidities, and adverse events associated with HT including the following: arrhythmia, thrombosis, severe hypotension, seizure during re-warming, scalp edema, skin breakdown, sclerema neonatorum, thrombocytopenia, and infection. These outcomes will be addressed in future NER studies. We summarized demographic and clinical characteristics with percentages for categorical variables, mean (and standard deviation) for normally distributed variables, and median (and interquartile range) for other continuous variables. Hospital characteristics come from the VON Annual Survey. From 2006 to 2010, 95 centers registered infants in the NER (Table 1). Participating hospitals averaged 686 (Quartile 1 (Q1): 473, Quartile 3 (Q3): 830) annual NICU admissions. A complete list of participating hospitals is presented in Table 2. We averaged each center’s annual volume across all of the years in which the center submitted NER records. The mean number of infants that met eligibility requirements per center was 44.5 (Q1: 15.0, Q3: 57.0). Almost all (97%) NER centers were non-profit (Table 3). Minority-serving hospitals, those that treat >35% black infants,  constituted 18% of the participating hospitals. Over three-fourths of the participating centers had pediatric residents or neonatology fellows working within their NICUs. Almost all centers had MRI scanning capability. *Based on the last year in which the center submitted NER data. VON classifies participating NICUs using a method based on the AAP Levels of Neonatal Care classification set forth by the Committee on Fetus and Newborn . The VON annual survey does not differentiate between Level IIIC (those that provide major surgical services excluding serious congenital heart anomalies that require cardiopulmonary bypass or extracorporeal membrane oxygenation (ECMO)) and Level IIID hospitals (those that do provide major surgery including surgical repair of serious congenital heart anomalies or ECMO). All NER hospitals classified themselves in the annual survey as subspecialty intensive care (level III) hospitals. The majority (52%) were level IIIB hospitals, which have no restrictions on the duration of mechanical ventilation but do not provide major surgery. Of the 4232 eligible infants, 59% suffered a clinically apparent seizure within the first 72 hours of life, 50% had a 5 minute Apgar score of 3 or less, 38% had HT, 18% had stupor/coma, and 2% had neuromuscular blockade. HT as the sole eligibility criteria accounted for 8% of the entire sample. Many infants (39%) experienced more than one eligibility criterion. Among infants with multiple eligibility criteria, 30.7% received hypothermia, 28.1% had an Apgar score of 3 or less, 26.9% had a clinically apparent seizure, 17.2% had stupor or coma, and only 1.2% had neuromuscular blockade. Registered infants had a median birth weight of 3298 grams (Q1: 2905, Q3: 3685) and a median gestational age of 39 weeks (Q1: 38, Q3: 40). Over one-third of infants were not admitted to the NICU until 6 hours after birth (Table 4). Of those not admitted until after 6 hours, 81% were outborn. Sixteen percent were small for gestational age. Over 60% of infants required transport. Over half (56%) were delivered by cesarean section (C/S), the majority of which had a trial of labor before the C/S. Fourteen percent of infants had a traumatic birth injury. A cord gas was obtained at the time of delivery in 53% of enrolled infants. Of those obtained, the mean pH was 7.0 (Q1: 6.9, Q3: 7.2) and the mean cord gas base excess was −12.2 (Q1: -17.6, Q3: -6.0). *The NER specified arterial cord blood gas from 2006–2008 but in 2009–2010 included umbilical cord blood from any source. Of NER infants, 64% received ventilator support, 38% received HT, and 65% received anticonvulsants for any indication (Table 5). Thirteen percent received inhaled nitric oxide and 3% received ECMO. Approximately 9% of the infants had surgery during their hospitalization, mainly abdominal. Sixty-six percent of infants underwent a head MRI and 49% received a cranial ultrasound. Sixty-seven percent had a full channel encephalogram (EEG) while 33% underwent amplitude integrated EEG monitoring. Overall, 36% of infants did not have a blood gas obtained from any site (arterial, venous, or capillary). Of those infants with a value, the worst gas results yielded a mean pH of 7.1 (Q1: 7.0, Q3: 7.3) and a mean base excess of −13.0 (Q1: -20.0, Q3: -6.0). Of all infants, 87% survived (Table 6). Among the survivors, at discharge 38% were on anticonvulsants, 86% received all feeds by mouth, 6% had home monitoring, and 1% had ventilator support. The typical length of stay among surviving infants discharged to home was 11 days (Q1: 7, Q3: 19). Of infants that died during their initial hospitalization, the median day of death was day 4 (Q1: 2, Q3: 9). A patient registry is an organized system that uses observational study methods to collect uniform data and evaluate specified outcomes for a population defined by a particular disease, condition, or exposure, and that serves a predetermined scientific, clinical, or policy purpose(s) . Registries can support clinical conditions, health care services, or products, and can address questions ranging from treatment effectiveness and safety to the quality of care delivered. The VON NER captures data and characterizes infants with NE and a subset treated with HT. To increase external validity, inclusion criteria for the VON NER are intentionally few and simple: the presence of seizures and/or altered consciousness (stupor, coma) during the first 72 hours of life. Additional inclusion parameters capture all potentially encephalopathic infants treated with hypothermia independent of their neurologic status and infants whose neurologic status might be difficult to assess (e.g., paralyzed, mechanically ventilated, or sedated infants). Historically, the presence of NE has been considered sine qua non of hypoxic-ischemic injury or birth asphyxia. However, the etiology of NE is not limited to hypoxic-ischemic injury and displays considerable diversity . Only a small proportion of infants in the NER had documented exposure to acute intrapartum asphyxia (“sentinel events”). These findings reflect previous research suggesting that a minority (25-35%) of cases of NE attributed to birth asphyxia have a clear contributing sentinel event in the intrapartum period [13, 19]. The VON NER is being used describe the frequency with which recognized antecedents of NE occurred in a large sample of encephalopathic term newborns. These findings will have implications for future studies of the etiology of NE. Timely recognition of NE infants affected by HIE is crucial to the success of HT. Very few infants in the Registry were identified as having altered consciousness on neurologic exam. In fact, the most common route for entry was following a seizure. Among the subset of NE infants caused by HIE, by the time an infant suffers seizures it may be too late to achieve the full benefit of HT [20, 21]. Given that birth asphyxia is often presumed the etiology of NE, it is striking to note that umbilical cord blood gas examinations were obtained in just over half of the infants during their perinatal courses. Similarly, less than 40% of the infants had blood gas sampling performed following birth. Since neurologic exams and umbilical and cord blood gas examinations are commonly used tests to determine whether or not HT is appropriate, these data suggest there is room for improvement in the recognition and evaluation of NE. Nearly four in ten (38%) NER infants were eligible due to exposure to HT. However the majority were also encephalopathic and in only a small percentage (8%) was HT the sole criteria for eligibility. One third of infants receiving HT were admitted after 6 hours of life when any neuroprotective benefit from HT may be diminished. Over 60% of NE infants required transport, which may be a significant contributing factor in the observed delay in admission. Identification of gaps between the conditions for implementation of HT in clinical trials and in what is observed in clinical practice and identification of areas of improvement are focused areas of ongoing NER research. The optimal routine evaluation and treatments of infants with NE is unknown. The majority of infants were treated with anticonvulsants but significant variation was noted in the approach to electroencephalographic monitoring. Only 66% had optimal imaging (head MRI) and 23% underwent a suboptimal exam (head CT) according to accepted quality standards . Ongoing work of the NER will identify and document variation in the evaluations and medical treatments these infants receive, providing valuable information for future RCTs. Variation in patient selection and adherence to established protocols contributes to differences in survival, adverse events, and long-term outcomes for treated infants [23, 24]. Among infants in the NER, 13% died, a proportion similar to the mortality rate of NE observed in a population based report by Badawi et al. (9%) despite different inclusion criteria . Of infants that survived to discharge, a significant proportion required ventilation, monitoring, and other medical care at home. These findings are consistent with previous observations of the medical burden and mortality associated with NE infants and underscores the need for improvement of the quality of care. The NER provides benchmarking data that member centers use while participating in VON multicenter quality improvement collaborations. A large proportion of cerebral palsy, cognitive disability, and epilepsy arise in infants born at term or late preterm . In contrast to preterm infant births, the births of term and late preterm infants are scattered over a broad range of facilities, many of which care for relatively few infants each year with NE. NER hospitals may be the best representation of those caring for encephalopathic infants in the “real world” and represent a generalizable view of HT as it occurs outside the academic sector or in a research setting. VON NER centers are heterogeneous in terms of size and numbers of infant records submitted. However, the participating nurseries were largely non-profit tertiary referral centers. Slightly more than half were teaching hospitals. The UK TOBY Cooling Register also captures data on neonatal HT [26, 27]. The TOBY Register started after the TOBY trial of HT closed enrollment, upon recognition that many physicians were offering HT out of the context of any trial [6, 28]. It is a phase 4 study of the specific methods of the trial, with a narrower set of inclusion criteria than the VON NER. Comparison of information in the VON and the TOBY registries will be useful in understanding dissemination of HT when implemented strictly in accordance with a previous trial (TOBY) versus in a more broad clinical setting (VON NER). Registries have important limitations with respect to RCTs. RCTs have strong internal validity, but often are focused on a relatively homogeneous group of patients from whom significant numbers are excluded at the cost of external validity or widespread generalizability. Registries aim for greater generalizability with populations relevant to all clinical settings. The nature of registry data limits clinicians from applying registry data to clinical decision-making. However, careful data collection and analyses of the NER, with oversight by the Steering Committee, aim to limit the potential for bias and misinterpretation of data. Awareness and recognition of bias in registry data adds to its heuristic value for planning clinical research or guiding NICU policies. A registry is well suited to the study of the heterogeneous population of NE infants and to the characterization of how interventions such as HT are implemented in clinical practice. This manuscript describes the methods and initial demographic results of the VON NER. Future manuscripts are planned on antecedents of NE, evaluation and treatment of neonatal seizure, optimal neuroimaging of NE infants, and hypothermia for HIE in routine practice. Joe Carpenter – performed substantial contributions to Registry design, database construction, and statistical analysis. The VON NER is funded solely by the Vermont Oxford Network. The Vermont Oxford Network will pay the article processing charge. Drs. Horbar and Soll are employees of Vermont Oxford Network. The Vermont Oxford Network nor any of the authors will receive reimbursements, fees, funding, or salary as a result of the publication of this manuscript. On December 20, 2006 the Food and Drug Administration (FDA) approved the Olympic Cool-Cap® device to provide selective head cooling in infants with clinical evidence of moderate to severe hypoxic ischemic encephalopathy. The FDA has required that Olympic Medical Corporation provide Cool-Cap® users the opportunity to enroll cooled infants in a registry. Olympic Medical Corporation contracted with the Vermont Oxford Network to make its Registry available to Cool-Cap® users who are members of the Network. The Vermont Oxford Network provides Olympic Medical Corporation with special de-identified reports for these infants which Olympic Medical Corporation may choose to submit to the FDA for post marketing surveillance. RP performed the primary analysis and interpretation of data and was responsible for primary manuscript preparation. PB participated in the study design and construction and reviewed the manuscript. EE performed statistical analysis and manuscript review. JH conceived of the study and participated in its design and coordination. MK performed the statistical analysis and reviewed the manuscript. TI participated in the study design and construction and reviewed the manuscript. KN participated in the study design and construction and reviewed the manuscript. TR participated in the study design and construction and reviewed the manuscript. RS participated in the study design and construction and reviewed the manuscript. All authors read and approved the final manuscript.